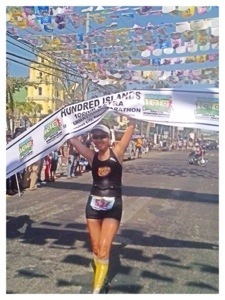 I went to Hundred Islands to join the 50Kilometer Ultramarathon with no race strategy and no goals. I just want to run LONG. It was a choice between this race or Clark Marathon I wanted to get back into running an ultramarathon after a long hiatus from racing and joining ultrarunning events since November 3. 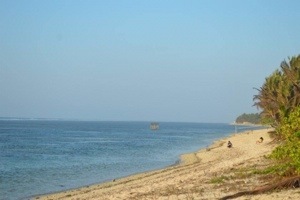 We got into the island after a 5 hour drive from Manila. A great view welcomed us. 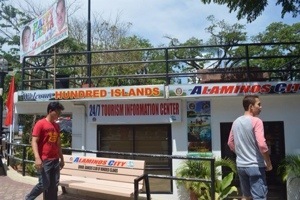 We entered the Hundred Islands Lucap Wharf in Alaminos on Saturday morning. It was a great SUNRISE. Life is! After eating breakfast and getting a place to rest, we went back to the Tourism Office for a very simple get-together party and race kit claiming and briefing. The gun start for the 100K runners was at 9am. They passed by the place where we are staying. Despite the small number of participants who are mostly elites and Kenyan runners, there are so many roving marshals in motorcycles and ambulance that passed together with the convoy. It looks like this will be a great race in terms of having enough marshals to monitor the race and ensure our safety. There were less than 40 runners who joined the race for 50k. 30% are elites/Kenyans. 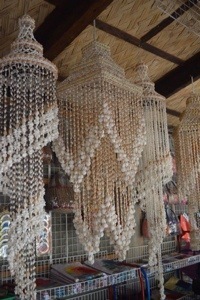 The rest are mostly from Baguio and Pangasinan. It is good to see more runners joining longer distance events even in the provinces. Given that none of the familiar faces were present in the race, I ended up chatting with Kenyans and elites. You can actually spot the difference. The elites are minimalists – wearing really short shorts, running singlet and running shoes with tanned skin and toned muscles. The conversation is totally different…Where did you last win? What was the cash prize? Who holds record for this and that? They talk about marathon finishes and a more than 3 hours marathon meant a bad race for them. I love it when people don’t compare and bully others not in their league – that’s how it should be. Then the Kenyan asked me, “what’s the longest distance for ultramarathon you have ran?” told them the longest was 200 and they were like. “Wow, this will be easy for you. “You something”, she said. I said no, I am not fast. 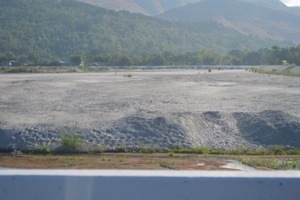 I can just keep running forever when I decide to… She said ultramarathon is difficult, She ran Mayon 360 and it’s painful. Took long to recover and I keep quitting…That’s why I admire others running long. Me, I can’t! (She was the champ in the first edition.). “The conversation made me admire these elites and Kenyans. They could easily tell me, “Nah, this loser, you’re so out of place here…” But they opt to respect our differences as athletes. As I spent some moments I silence, I reflected on, “Ask and you shall receive.” This was the verse for the day in the devotional I am following. “Lord, can I get my long-time goal of a sub 5 hour 50k?” —- Did you train for it, Tin? You haven’t even run more than half a marathon on the road since WC200 last November. “Okay, can I win? At least third? !” —- Let’s be realistic, Tin! 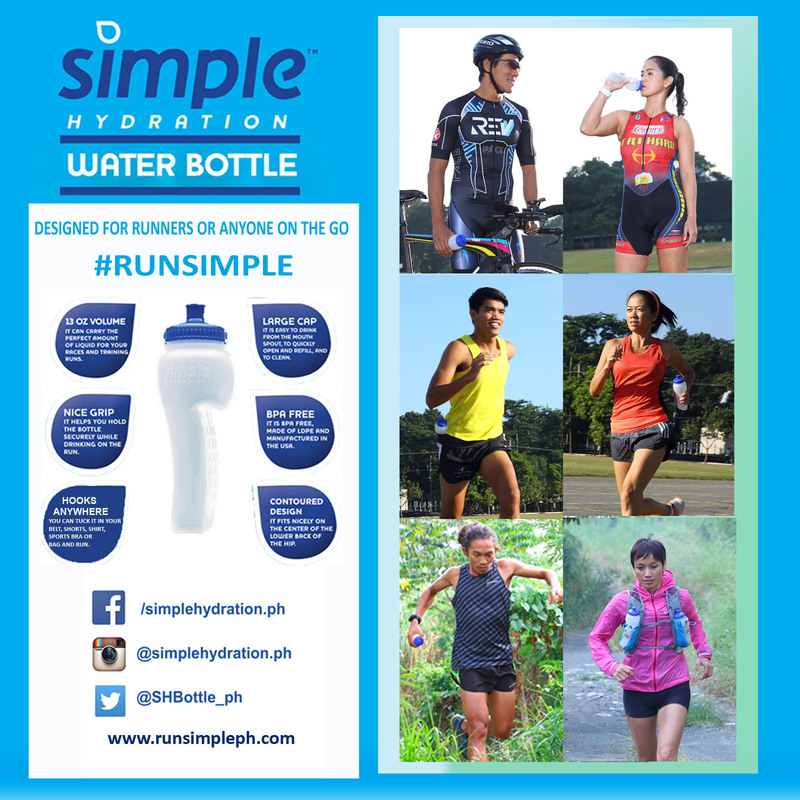 With their 42 kilometer records, even if they walk the last 8 kilometers, no way will you catch up. “Last try; please give me strength not to be the last runner.” —- You have to work for it, Tin! We’re only five girls. The fifth one is from Baguio and you know what kind of quality training they could get from their place. I need to work/run hard. At the first kilometer, the two Kenyans were running at my pace. Melinda delos Reyes, an elite was beside me and the girl from Baguio behind me. We were running a few seconds below 6 mpk, chatting. I wanted some fresh air so I tried to overtake; the Kenyans still opt to stay behind me. I was indeed leading the pack at kilometer 1 with 2 Kenyans and an elite female runner! How cool is that? – Maybe, the only chance this lifetime. Answered prayers???? Haha…They were just warming up actually. I went behind them again and told Melinda to speed up and go ahead. And then they started chasing each other! 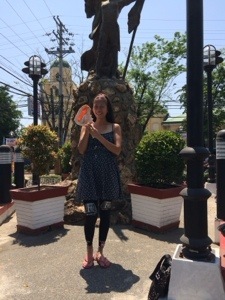 I hanged around a bit with the girl from Baguio and then ran on my own. 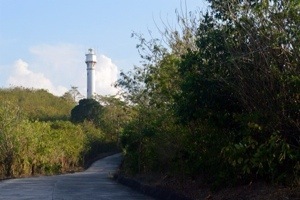 It was a rolling terrain for the first 12 kilometers until we made a left to Anda. I was taking it easy, really easy and menstrual cramp has been bugging me. It’s not the first time I had to deal with the time of the month in a race but it’s the first time I had to on the first day, a few hours ago! I was struggling with the pain and the messiness it brings! 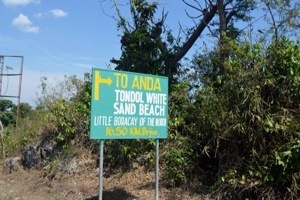 As we turned left to Anda, I had no idea what to expect. I thought it was just 8 kilometers out and back but that was a long 14 kilometers of steep uphills and downhills! I said this is a training run and I got what I wanted. 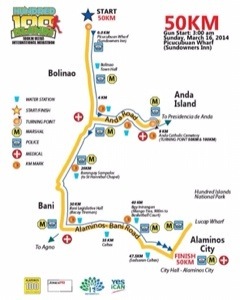 The 14 kilometers served as hill repeats for me, it was like going up and down Buendia-Kalayaan flyover 7 times. At the turnaround, I saw the big gap of the top 3 female runners. As always, it was a slow first half marathon for me and they went really fast! 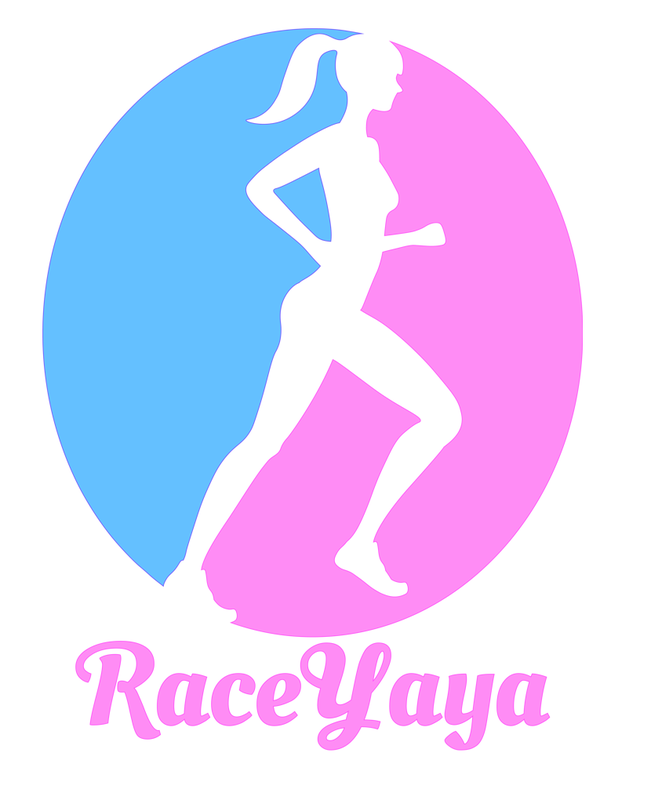 The fifth female runner was only 2 kilometers away. The goal was to keep moving despite the toll the hills are giving on my legs. My pace went faster. I lost a few minutes from cleaning myself up every hour just to get the girl thing out of the way. It was a struggle to manage the call of nature when it’s the time of the month! As I exited Anda and went back to the national highway the marshals told me the third female runner is just 15 minutes away. 26th Kilometer done! I was way too slow compared to my previous races but maybe I can challenge myself to run the last 24 kilometers faster. Who knows, I might end up catching up the Kenyan. There will be more downhill running but the heat of the sun will be the next struggle. At this part of the race, everything just loosens up. I feel like my menstrual cramp no longer bothers me. My tight hip is not acting up anymore. I just keep moving as if nothing is painful. I am more than halfway and I just let a cheerful attitude take over all my struggles. As I reach kilometer 42, I thank God for another marathon. 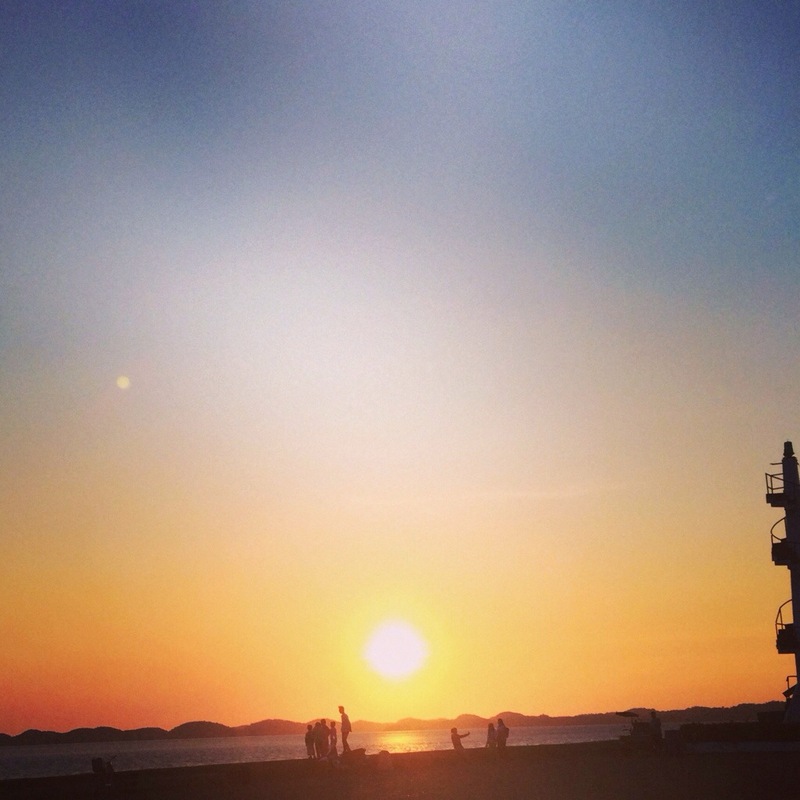 A few months ago, I thought I cannot run anymore with all the pains I have. Now, the goal is to finish an ultramarathon again…..and a bonus is I actually have the chance to chase the Kenyan who is less than a kilometer away. Forget about all struggles and chase her! 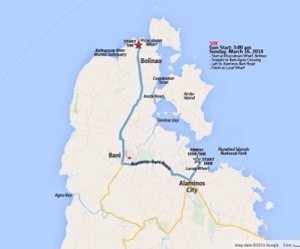 I didn’t do my usual long pit stops and just grab a buco juice every 5 kilometers and kept dousing myself in water. I’ve forgotten how messy I could end up with by getting myself wet. An ambulance stopped at me to check if I was okay as it looked like I was bleeding. No time to be maarte, I am racing! The locals were out to cheer for us. Knowing it was a Kenyan ahead of me, they were shouting, go Pinoy! 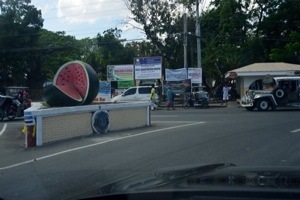 Malapit lang kalaban mo! She seems to get faster though whenever I get nearer. At one pit stop, I finally saw her, just 200 meters away. I told my crew not to overtake her so she wouldn’t know I am behind. 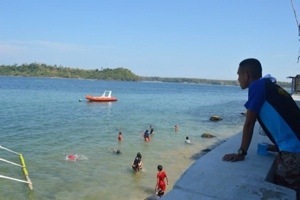 I was at the same pace with a guy from Pangasinan. We were 5 meters behind! He said, Go for it! I can’t believe this is happening. I am actually going to compete with a Kenyan for a top three finish in the podium. I took a deep breath, ran and said, “Hey, girl are you okay?” She just looked at me like I was a ghost and sprinted! 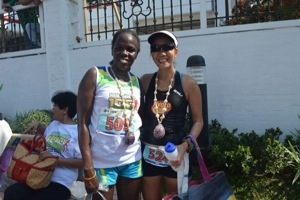 On a regular road race in Manila, Peris is on her way back while I am still halfway. So happy for the chance to race with her and end up as friends after. Running an ultramarathon creates a bond you cannot explain. after the race you feel like best friends who survived a storm together. At the last one kilometer to the finish, the people were cheering for me. I was in tears as I turned left to the last 500 meters. A motorcycle approached me. And then, there was about five or perhaps more than five of them escorting me to the finish line…..I was hearing loud cheers. I was seeing smiling faces. I was smiling at the Race Director who was with the Governor and the mayor of the towns we passed clapping their hands. I was waving back to the people. It was a great race. The route was hard enough to challenge your grit! The sun was punishing! 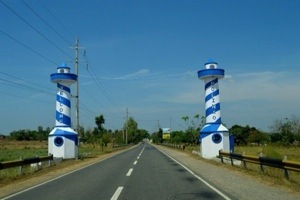 The ambiance is awesome running with the ocean breeze and on the well-paved roads of Bolinao, Anda and Alaminos. The organization was great. 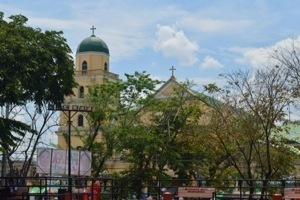 The support of the local government and the people of Pangasinan were amazing. It wasn’t my best race performance for the distance; perhaps it’s the race where I had more challenges to deal with – physically, mentally and emotionally. 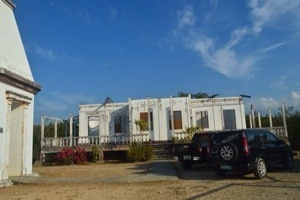 I am on my way home from Hundred Islands, Alaminos, Pangasinan – STRONGER! I WON! 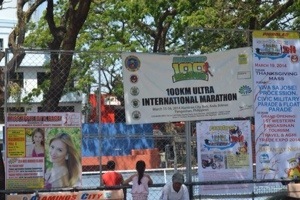 The Hundred Islands Ultramarathon is a great destination race. 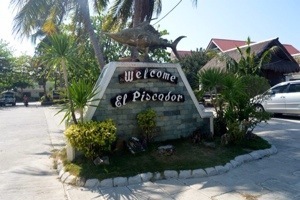 You can race and enjoy the beauty of Pangasinan – Hundred Islands (www.hundredislands.com), Bolinao’s beaches and Anda – the Boracay of the North they say. I hope to be back next year with my family and friends. Next time, I won’t just cross the finish line. I will tour the place and enjoy to celebrate the victory. Yes, I am claiming as early as now. Thanks to everyone for the support! Thanks to my sponsors, Hydrococo for my hydration and support, Compressport for my training, racing and recovery gears, Simple Hydration bottle, Spider Bottle, Chica Bands, Run PH for my favorite visor, Adidas Body Care for keeping me fresh always haha! Joe de Serna’s Spartan Up Book: Read up, Spartan Up, Keep Up!